The desert fascinates me. Perhaps because the terrain can be so similar, it’s the light, particularly in the sky, that catches my eye; moods are always changing and a sudden storm creates drama from the rather mundane. 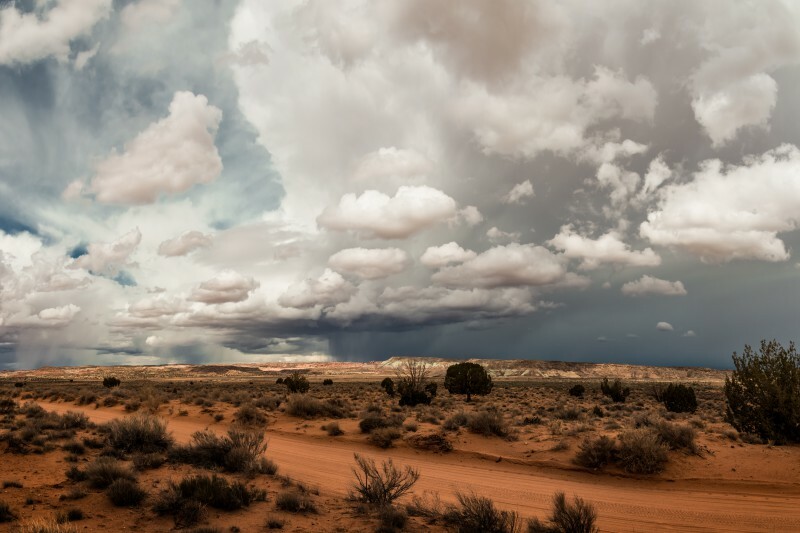 The subtle light of white clouds contrasted against the darkening sky, the red sand, and the smell of distant rain intrigued me with this shot. So much of Southwestern photography includes iconic rock formations, which make it nearly impossible to find a unique perspective. To me, the ever-changing sky is that which can transform an image into a work of art. Like many, I started out in black-and-white film as a kid, enthralled with the photos by Ansel Adams. Now I am consumed by the digital darkroom and mastering its power, but subtlety in rendering is a surprising challenge that I think this photo achieves. This confluence of technology and esthetics fascinates me. I am a senescing scientist and Professor of Pathology at the University of Utah, but I consider fine art photography to be my burgeoning passion. I have eclectic taste in subject matter where light and form, of course, are key. The 2013 Art of Photography Show is my first success in a curated exhibition.